The new Hartford HealthCare Cancer Institute Melanoma and Skin Care department, the area’s first of its type, is dedicated to melanoma and other skin malignancies. Dr. Omar Eton, the center’s medical director, arrives at Hartford HealthCare from Boston University Medical Center with 30 years’ experience that includes work at two of the nation’s top cancer centers, Memorial Sloan Kettering in New York and MD Anderson in Texas. Our staff includes dermatologists with experience at some of the nation’s leading melanoma centers, nutritionists, psychosocial specialists, genetic counseling and nurses. (Learn more about Dr. Eton.) We also have access, through our membership in the Memorial Sloan Kettering Cancer Alliance, to clinical trials, dermatopathology review and tumor boards that review complex cases. Dr. Eton will highlight immunotherapy and related clinical trials at the center. "Immunotherapy is an effort to coax your own natural immune system to attack tumor cells," he says. "The way it works is that we can infuse antibodies -- and, soon, maybe other drugs --that actually block the inhibitions of those immune cells from attacking the tumor, then make the tumor disappear." Melanoma, the most serious skin cancer, accounts for only 1 percent of skin cancers yet causes most skin-cancer deaths. It’s the byproduct of DNA damage in the cells that produce the melanocytes (melanin) that give your skin color. Overexposure to ultraviolet light, whether from the sun or tanning bed, is a leading cause of that damage. Once existing cells have been altered, new cells can grow unpredictably and potentially form a mass of cancerous cells. Maybe it’s time to take a closer look at yourself. Skin cancer is the most common form of cancer in the United States: 76,665 people were diagnosed in 2014 (the latest available government statistics). 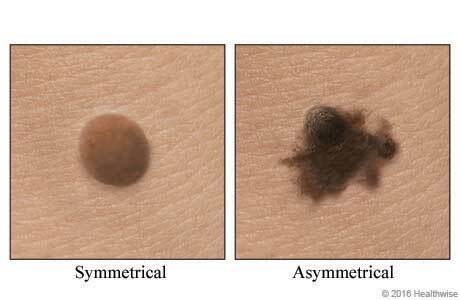 Melanoma is the third most common skin cancer, after basal cell and squamous cell carcinomas. Connecticut, with 21.9 cases per 100,000 people, is rated No. 26 among states with the highest incidence of melanoma of the skin. Vermont (35.7) at No. 2, New Hampshire (32.5) and Rhode Island (26.7) at No. 9 are among nearby states in the Top 10 unhealthiest states for skin cancer. Melanoma of the skin was the fourth most frequently diagnosed cancer in males (545 cases) in Connecticut in 2010 with 545 cases. It was the sixth most frequently diagnosed cancer among the state’s females (389 cases) in the state that same year. One in five people develop skin cancer during their lifetime. Are you the one? You’re a candidate if you have pale skin, endure excessive (or unprotected) exposure to the sun’s ultraviolet rays, have a family history of skin cancer, experienced severe sunburn or have numerous or unusual moles. Check your skin regularly for anything unusual. 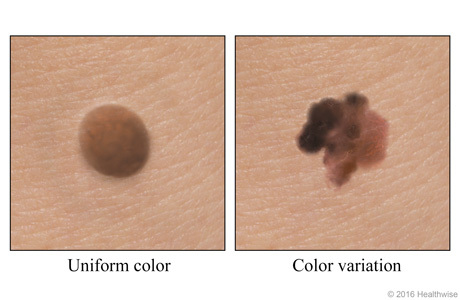 A mole, either flat or raised, on most people appears an even shade of brown, tan or black. Whatever their shape, either round or oval, they’re usually less than about a quarter-inch in diameter. Let's say you find a suspicious mole or lesion on your body. Dr. Robert Piorkowski, a surgical oncologist at Hartford Hospital and one of the Melanoma and Skin Care Center’s experts, says to follow the ABCs. E: Evolving. “Any change — in size, shape, color, elevation, or another trait, or any new symptom such as bleeding, itching or crusting — points to danger,” he says. Doctors for many years have attributed melanoma to a variety of causes, among them the sun’s ultraviolet rays and genetic mutations. If melanoma runs in your family, it’s likely that gene changes have passed from one generation to another. UV-A: These longer wavelengths, present year-round, cause sunburn and cataracts while contributing to aging and wrinkling of your skin. If you take the proper precautions with sunscreen, UV-A rays can be good for your health by enhancing the production of Vitamin D, which helps absorb calcium in the bones and resists multiple chronic diseases. UV-B: Stronger than UV-A and most intense in the summer months. If you return from the beach with a classic lobster-red sunburn, UV-B rays probably caused it. UV-B rays are most damaging when they upset the normal cycle of skin cell production. Older cells at your skin’s surface typically die and fall off, pushed out by new cells. But when the sun’s rays damage the DNA in some cells, subsequent cells begin an out-of-control growth pattern that can lead to cancer. Tanning beds also emit UV rays. Using a tanning bed before age 30, even occasionally, increases your risk of developing cancer. Stage O: Abnormal melanocytes found in the outer layer of your skin. Stage 1: A tumor up to 1millimeter thick (Stage 1A), with no break in the skin. Stage 2: A tumor between 1 millimeter and 2 millimeters thick (Stage 2A), with a break in the skin. Or it could be between 2 and 4 millimeters thick (Stage 2B), with no break in the skin. The cancer has not spread to the lymph nodes or organs. Also: more than 4 millimeters thick (Stage 2C), with a break in the skin. Stage 3: A tumor, at any thickness, that may or may not include a break in the skin. Stage 4: The cancer has spread into the body, reaching the lungs, liver, lymph nodes, bone, small intestine or brain. Cutaneous T-cell lymphoma and other rare skin malignancies. Patients with genetic syndromes and predispositions to skin cancer. Targeted therapy: Drugs that attack and shrink cancer cells, often with less damage to normal cells than with chemotherapy. Immunotherapy: Your own immune system fights cancer by using substances made by your body (or in a laboratory) to attack cancer cells. Chemotherapy: Drugs that either kill cancer cells or prevent them from growing. Radiation therapy: High-powered X-rays or other forms of radiation that, like chemotherapy, kills or inhibits the growth of cancer cells. Surgery: The melanoma, and some surrounding normal tissue, are removed. The basics on skin cancer from HHC surgical oncologist Dr. Robert Piorkowski. The best protection against cancer caused by the sun’s ultraviolet rays is a good sunscreen applied routinely whenever you’re going outdoors. Do you know what a sunscreen’s SPF value means? It represents the number of minutes it takes to get the equivalent of one minute of ultraviolet rays. So after applying an SPF 20, your body will be exposed to the equivalent of one minute of ultraviolet rays for every 20 minutes spent in the sun. "A shot glass is one ounce. Apply that amount every two hours while you're outside on exposed areas," says Dr. Frank Santoro of the Melanoma and Skin Center. "Apply a thin layer on all areas 15 minutes before going outside." Higher SPF values offer more protection, but at a diminishing rate. An SPF 15 sunscreen filters about 93 percent of UVB rays, an SPF 30 about 97 percent, an SPF 50 about 98 percent and SPF 100 about 99 percent, according to the American Cancer Society. "SPF 30 is the magic number," says Santoro. Use sunscreen on all skin that will be exposed. Reapply every two hours. When shopping for a sunscreen, look for a product that protects against all types of damage caused by the sun. Food and Drug Administration regulations require a “Skin Cancer/Skin Aging Alert” warning on any sunscreen that’s not broad spectrum or has an SPF value between 2 and 14. Sunscreens that make water-resistance promises must indicate how long the claimed SPF level will last, either 40 or 80 minutes, while swimming or sweating. Manufactures cannot claim a sunscreen is either waterproof or sweatproof, nor can it claim instant protection when first applied or protection for more than two hours without reapplication. The FDA rates SPF 15 as the minimum for protection against sunburn and skin cancer, but the American Cancer Society recommends SPF 30 or higher. Dr. Frank Santoro of the Melanoma and Skin Care Center explains the numbers behind a sunscreen's SPF. Dr. Frank Santoro explains the numbers behind a sunscreen's SPF.